For the similarly named Dutch Sheik player, see Smasher:Amsah. aMSa (standing) after beating ChuDat (sitting) in Winners Finals of their pool at Apex 2014.
aMSa is currently ranked 1st on the Japan SSBM Rank 2017 and 9th on the 2018 MPGR. aMSa is a very technical and punish-heavy player, heavily incorporating double jump cancelling and parrying into his gameplay as Yoshi to escape pressure and create lengthy, damaging combos of his own. He is also dangerous at the ledge; he frequently utilizes the Egg Throw ledge stall to bait bad approaches, is able to ledgedash proficiently, and threatens early KOs by occasionally using ledge-hopped Egg Lays as a mixup. He also makes the most out of Yoshi's otherwise mediocre mobility with his fantastic platform movement and ledge snap tricks, as shown partially in his tech skill video. aMSa also has a large amount of game knowledge; he has compiled a detailed chart of KO percentages for all of Yoshi's smash attacks on every stage, utilizes port mechanics to gain extra frames to escape otherwise guaranteed chain grabs from Sheik, and has very precise aim with Egg Throw and F-air, especially when edgeguarding or extending combos. aMSa has more even sets against smashers with more familiarity with the Yoshi matchup, especially in Japan. He tends to have more trouble against Peach players, and players with a more patient playstyle in general who can combat his egg zoning (such as Hungrybox). He also has a history of struggling against Captain Falcon players, which he says is Yoshi's worst matchup due to the character's true combos out of grab and attacks that break Yoshi's double jump armor at low percents. After taking top 8 in a Japanese tournament using only Yoshi, aMSa piqued the interest of the international scene. 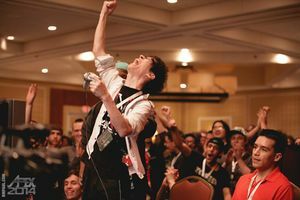 He made his international debut at EVO 2013, where he managed to sweep through his pool without losing a set, knocking smashers such as Flow and Codi into losers' bracket and making it to quarterfinals on the winners' side. He then managed to take a game off of Mew2King in the second round of brackets, shocking many spectators, although Mew2King still ended up defeating aMSa 2-1. In losers' bracket, aMSa defeated another notable smasher in Mr. F, achieving a final placement of 25th after losing to DaShizWiz. He later played many other top players in friendlies, including Armada, Axe, and Hungrybox, managing to hold his own in each one (most of his matches went to the last stock); his most notable moment in these matches was when he 4-stocked SilentSpectre, which many other professionals have never achieved, in or out of tournament brackets. aMSa's performance split the community's opinions on him; some claimed that he had the potential to take top 16 in his next national event, while others claimed that his relatively high placement was the result of a comparatively easy bracket compared to that of many other players. His stellar performance at EVO resulted in smashers voting him in at 77th best in the world on the 2013 SSBM Player Rankings; even there, however, panelists shared split opinions, with several top professional players arguing that he was overrated and would not perform as well in the future. aMSa returned to the United States to compete in Apex 2014. Defying all expectations again, he tore through winners' bracket in the first round of pools on the first day, beating Green Ranger 2-0 and ChuDat 2-1 for the winner's position, and defeated Kage in a best-of-5 exhibition match 3-2. The next day, he caused more enormous upsets by defeating Silent Wolf 2-1 and Fly Amanita 2-0, securing a spot in winners' finals of the pool. However, he was then defeated by PPMD in winners' finals and Colbol in losers' finals, resulting in his 9th place finish in the second largest Melee tournament at the time. After the tournament, he once again fought many other professionals in various exhibition matches, managing to take a game off of Tafokints, win best of 3 sets against MattDotZeb and Vish, and win best of 5 sets against SFAT, Westballz, and Mew2King's sandbagging choices. Although he did not perform as well in doubles with fellow Yoshi main V3ctorman, he still garnered an enormous amount of fan support for demonstrating unprecedented levels of play with his character. aMSa would later attend the Japanese MLG Anaheim 2014 qualifier, Sumabato DX Melee 11, in May. However, he performed very poorly and did not win a single set, being taken out by his training partner Sheik in winners' bracket and then by Shippu in losers' bracket, finishing last at 13th place. This performance did not give him enough MLG points to qualify for the championship bracket, and although he took 2nd at KVO 2014 the day after, he needed to travel out of country again to accumulate enough points. Two weeks later, aMSa traveled to France to attend Republic of Fighters 3, a 5000 point qualifier. At this tournament, he achieved a first seed in his second round of pools after defeating Däumling and Cyr 2-0, and defeated players such as porc, Trif, and Zgetto in winners' bracket before being knocked into losers by Armada. He then defeated Overtriforce 3-1 in losers' quarters, and knocked out Ice 3-0 in losers' semis (with a 3-stock lead at the end of game 1), before losing to Leffen 2-3 in an incredibly close set in losers' finals that went down to the last stock, to take 3rd place overall in the singles portion of the tournament. Placing 3rd at this tournament allowed him to gather enough points to qualify for the MLG Anaheim 2014 championship bracket. He also teamed with Cyr in doubles and placed 7th. At MLG Anaheim 2014, aMSa didn't do well in his pool; he brought several of his opponents, such as Fiction, Westballz, and ZeRo, to game 5 (often down 2-0 in his favor), but almost always lost in 3-game reversals. Even though the tournament weighed game counts as well as match counts, his stray wins were not enough for him to be seeded any higher than losers' round 1 in the championship bracket. In the championship bracket, he faced S2J first, and won the first two games. However, just like many other players in the championship pools the day before, S2J came back 2-3, knocking aMSa out and into a 17th place finish overall. aMSa also attended CEO 2014, but did not make it out of his bracket pool, losing to PorkChops 2-3 in winners' finals and Wenbo 1-3 in losers' finals of the pool, thus placing 33rd in Melee singles at the tournament. However, he did slightly better in Melee doubles, where he placed 9th with PL. aMSa made his next appearance at Kings of Cali 4, where he defeated both MacD and Scar 2-0 in the second round of pools, and was seeded first coming out of his pool into the top 32 bracket. He defeated DendyPretendy 3-0 and Ken 3-0, setting up a match between him and Mew2King in winners' quarters. In a shocking upset, after losing the first game, aMSa was able to win the set 3-1. He then lost to Mango 0-3 in winners' semis, and to Lucky 0-3 in losers' quarters, however, resulting in a 5th place finish overall in singles. In doubles, he placed 7th with PL, losing to Westballz and ZeRo 1-3 in losers' top 8. The following week, aMSa attended EVO 2014, and won a local tournament at Press Start Gaming Center shortly before the main event started, defeating Ice 2-0, G$, and Ice again 3-2 for the 1st place finish. Like the previous year, he swept through his round 1 pools without dropping a set, then defeated Tai in the second round bracket before losing to PewPewU's Fox 0-2. In losers', aMSa defeated Lambchops and Swedish Delight before losing to S2J again, ending his tournament at 17th place overall. 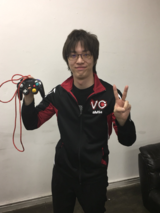 aMSa first attended the Apex Qualifier Battle Gate Way 6 in December 2014, where he placed 2nd, losing to Sobameshi in Winner's semis before defeating the likes of K.F, Kounotori, Flash and Sobameshi in a rematch before being defeated by Shippu in Grand Finals. He did not attend any other Apex Qualifiers or major tournaments until Apex 2015. At Apex, aMSa swept through his round 1 pool, getting 1st seed with no difficulty. In R2 Pools, he defeated top players such as Laudandus to make it into Top 48 bracket in Winner's side. There, he defeated Fly Amanita once again 2-0 before falling to Leffen 0-2. aMSa then made an amazing loser's bracket run, defeating Zhu 2-0, Lucky 2-1, and SFAT 2-0 to make Top 8, surpassing even his previous year's performance. In Top 8, he defeated KirbyKaze 3-1 before falling to Mango in a last stock, game 5 position 2-3 to end his run at 5th place, the highest placing competitor outside of the Top 6, at the biggest Melee tournament at the time, cementing his status as one of the best current players in the world. aMSa entered Genesis 5 in January of 2018. Here, he had a duo of upsets against top 10 players. First was SFAT, whom he delivered a 3-0. Second was Wizzrobe, the #1 ranked Captain Falcon player in the world, whom he had never taken a game off of in the past. Previously at Smash Summit 5, he placed last after losing to Wizzrobe. Between tournaments, he practiced with Gucci to hone his skills against the character. At G5, he was able to employ these strategies, and successfully defeated Wizzrobe 3-2 in a last game, last stock situation on aMSa's signature counterpick stage Yoshi's Story. He then advanced to Winners Quarters, where he faced Hungrybox, who sent aMSa to losers' bracket with a relatively close 3-0. In losers, he faced HugS for a spot in Top 8. HugS won the first two games, and aMSa followed up winning the following two. This led to a last game on Dreamland, which came down to the last stock, with less than thirty seconds remaining. After being pressured to the ledge, aMSa missed the timing on his Egg Throw stalling and fell, ending his run at an impressive 9th place. At EGLX 2018, Amsa went on one of the best tournament runs of his career. He started out the run by beating Prince Abu Narrowly in pools, with the end score being 2-1. He would go on to lose to SFAT in winners round one 0-3. Going to losers bracket this early can present the problem of a longer, more challenging bracket, but Amsa would manage to upset Swedish Delight 3-2, Ice 3-2, and Axe 3-0 to get into top 8 at the event. Once in top 8, Amsa would proceed to upset Crush 3-2, and Mew2King 3-1. He would end his run by losing to Wizzrobe 0-3, placing 4th at the event, only being outplaced by Wizzrobe, Plup, and Hungrybox. While aMSa is not known to play Brawl, he did play the Brawl mod Project M for some time. He initially started with Yoshi, as he did in Melee, but later decided not to play Yoshi competitively. He stated that he wanted to treat Project M as its own unique game rather than another Melee title, and also explained that certain key aspects of Yoshi didn't resemble those of his Melee appearance (parrying, for example.) Thus, aMSa used Lucario instead, and was considered one of the best PM Lucario mains in the world. He exhibits mastery over Lucario's many complex movement options and combos that not many other Lucario mains utilize in their playstyles even to this day, and was frequently the highest-placing Lucario player in several large regional and international Project M tournaments. With Yoshi, aMSa placed 65th at Apex 2014 in Project M singles, barely failing to make it out of his bracket pool. He later made his debut with Lucario at NINJA4, where he placed 2nd; he lost to Kaito in winners' semis, then defeated Shippu, Katiwari, and Opinthin to make it to Grand Finals against Kaito, where he lost again. He placed 2nd again at Republic of Fighters 3; he lost again in winners' semis, this time to Zen 1-3, then defeated Yomi 3-0, Clade 3-0, and Zen 3-1 in a rematch, then lost to Professor Pro 0-3 in Grand Finals. At CEO 2014, aMSa placed 9th in Project M singles; he made it out of his pool on the winners' side, but lost to ZeRo and TheReflexWonder afterward. He also placed 7th in Project M doubles with DJ Nintendo. aMSa was also a participant in the Super Smash Bros. Invitational at E3 2014, and was one of two international participants (along with ZeRo). Even with Yoshi unavailable for selection, he reached the four-way finals round using Olimar. He had the same score but less percent than ZeRo after the match ended, but it did not grant him the win under the Invitational rules; he was subsequently eliminated by popular vote in favor of ZeRo to take 3rd place overall. After the game's release, he picked up Greninja, and consistently places well in Smash 4 tournaments, placing 9th at Apex 2015, which included a 2-0 victory over Ally and close 1-2 loss to MVD, as well as defeating Boss, Nick Riddle, Rich Brown, and J.Miller in Round 2 pools. He also has a Yoshi secondary, but does not play him as often, as he is afraid that the dissimilarities between Yoshi's incarnations in Melee and Smash 4 will hinder his gameplay with both of them. After participating in EVO Japan 2018, he announced that he would be retiring from Smash 4. In the Apex 2014 "Salty Suite", aMSa faced off against DJ Nintendo's Bowser in the "Battle of the Dinos" and won 3-0. When asked to give a statement before the match, aMSa replied "I play to win," repeating said statement after he won. This phrase, commonly deliberately misconstrued as "I pray to win" (due to the "l" sound being pronounced like "r" in Japanese), has become a meme in the Smash community associated with aMSa, with his fans using the statement to cheer him on during tournaments or on streams. At Republic of Fighters 3, aMSa played throughout most of the tournament using the tag "IPTW", referencing this phrase. Due to the similarities of his gamertag with Amsah, aMSa played a best of 5 "grudge match" in friendlies at Pound 2016, with Amsah narrowly winning 3 to 2.
aMSa is the first non-American member of the VGBootCamp crew. aMSa served as a playtester for Super Smash Bros. Ultimate, alongside fellow competitive players 9B, Ranai, and Earth. Overtriforce vs. VGBC.aMSa (Yoshi) - Losers Q.F. This page was last edited on February 25, 2019, at 00:28.